With over 50 billion connected devices expected to be deployed over the next decade, M2M connectivity is set to be a major driver in the next phase of network growth. The rapid deployment of M2M solutions across a broad range of markets represents significant opportunities and challenges. M2M solutions are deployed in a wide range of industry verticals. This will require the deployment of billions of M2M nodes to collect, transmit and receive data from control applications. These nodes have wide characteristics in terms of the devices that they are associated with and the placement of those devices. Examples include Vending Machines, Gaming Machines, Points of Sale, etc. In many cases the M2M devices do not reside in proximity to any existing network and adding dedicated wiring is expensive and often impractical. Moreover, in many instances, the location and the aggregation of the M2M devices make wireless connectivity unreliable and costly. 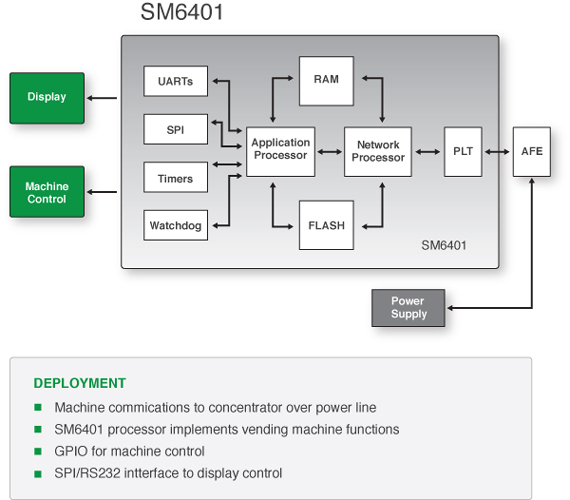 PLC is the natural choice of connectivity for any stationary M2M device, such as gaming or vending machine. NB-PLC is a cost effective and reliable option that takes full advantage of the ubiquity of the power wiring already connected to the devices. It provides the necessary security, bandwidth and reach that are typically required for DGC transactions.